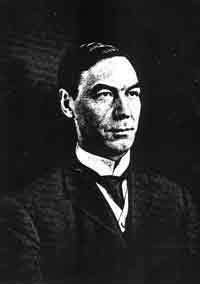 Charles Francis Haanel was a noted American New Thought author and a businessman. He is best known for his contributions to the New Thought Movement through his book "The Master Key System". The Haanel family was of Swedish origin and lived in Silesia, Prussia, before emigrating to Canada, and later to the United States. Charles Francis Haanel was born in Ann Arbor, Michigan, and was the fourth of six children., Michigan. He was the son of Hugo Haanel and Emiline Fox Haanel. When Charles was a child, the family relocated relocated to St. Louis, Missouri. His first jon was as an office boy for The National Enameling & Stamping Company in St. Louis. He worked for the firm for fifteen years before striking out on his own as a businessman and writer. In 1885, Charles Haanel married Esther M. Smith, and together they had one son and two daughters. In 1891, his wife died, and in 1908, Charles married again to Margaret Nicholson of St Louis, whose father was W.A. Nicholson. Charles was a member of the Republican Party, and was also a Freemason and a Shriner affiliated with St. Louis Keysytone Lodge no.243. He was also a supporter of the Missouri Athletic Club. He was a member of Pi Gamma Mu Fraternity, a fellow of the London College of Pyschotheraphy, and a member of the Authors League of America. Aside from all this, he was also a member of the American Society of Psychical Research; a member of the Society of Rosicrucians; a member of the American Suggestive Therapeutical Association; and a member of the Science League of America. During his life, Haanel earned and received several honorary academic degrees, including hon. Ph.D., College National Electronic Institute; Metaphysics, Psy. D., College of Divine Metaphysics; and M.D., Universal ollege of Dupleix, India. In 1912, Haanel published his most famous book, The Master Key System. It was written in the form of a course in New Thought, mental development, personal health and financial success. The book was heavily prooted in the pages of Elizabeth Towne's new thought magazine, Nautilus. By 1933, the book had reportedly sold over 200,000 copies worldwide. Charles Haanel practiced the financial principles that he himself taught, and as a result became a self-made success who owned several major companies. He was the president of the Continental Commercial Company, president of the Sacramento Valley Improvement Company, and president of the Mexico Gold & Silver Mining Company. Among the key points of Haanel's Master Key System are what he refers to as the 'laws of concentration, attraction, and harmonious thinking and action. In 1919, Napoleon Hill wrote Haanel a letter thanking him for The Master Key System. In the letter Hill stated, "My present success and the success which has followed my work as President of the Napoleon Hill Institute is due largely to the principles laid down in The Master-Key System." Haanel was also quoted in the best-selling self-help book The Secret by Rhonda Byrne, published in 2007. Charles F. Haanel passed away at the age of 83 years old in 1949. His ashes were buried in Bellefontaine Cemetary, in St Louis, Missouri.